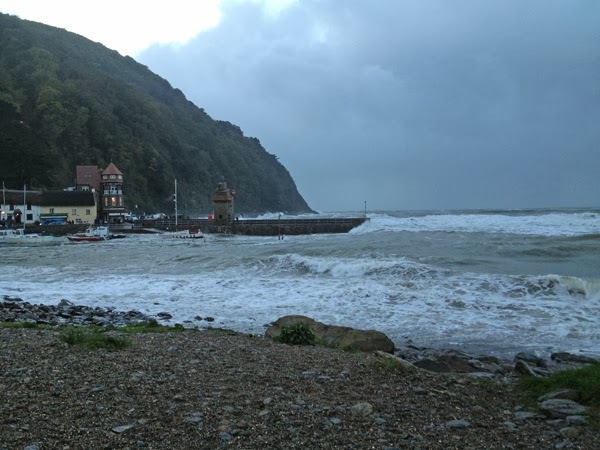 We live in Lynton which is half way up a hill, at the bottom of the hill is Lynmouth, which is 2 minutes drive away. 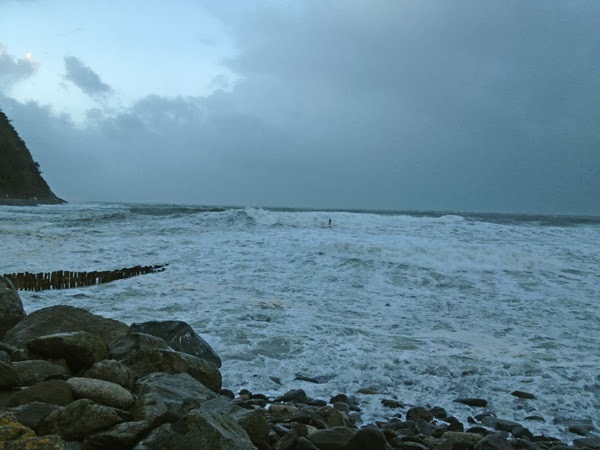 About a week ago we had a severe weather warning for a massive Atlantic storm, the storm didn’t really happen here, although I know other parts of the country were badly affected. But we had our storm on Saturday. 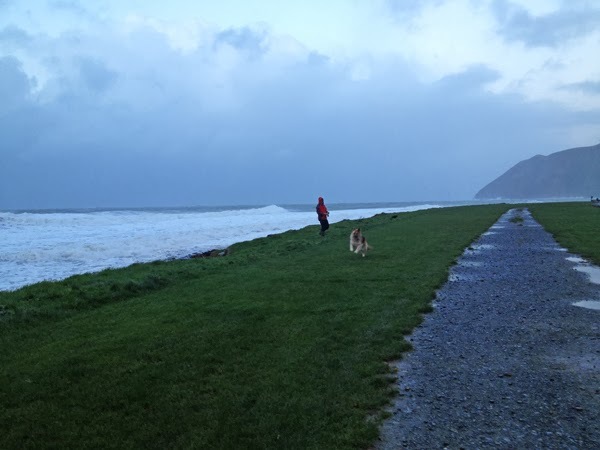 It was high tide at 5 pm, so Phil and I decided to venture out to buy fish and chips for our tea and see what the sea looked like. We weren’t disappointed, as we drove down the hill the sea looked higher than the land, I have never seen it look so dramatic. Stupidly we had left the camera in the office and so the following photo’s were taken with my iPhone. This is from outside the fish and chip shop looking west towards the Valley of the Rocks. This was taken from the same place, if you look carefully you can see a small black line, which was a surfer, there were several out surfing – Mentalists!! The harbour and the Rhenish tower, which shows how high the sea was. 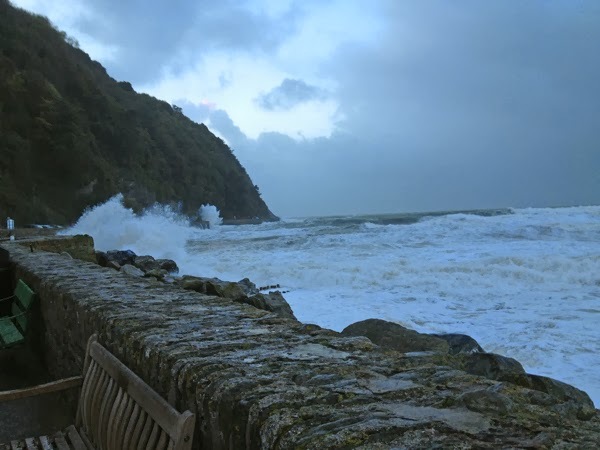 The 2 Lyn rivers meet at Lynmouth, there is a small harbour with a wall that divides the harbour from the river, the tide was so high the wall had disappeared completely. 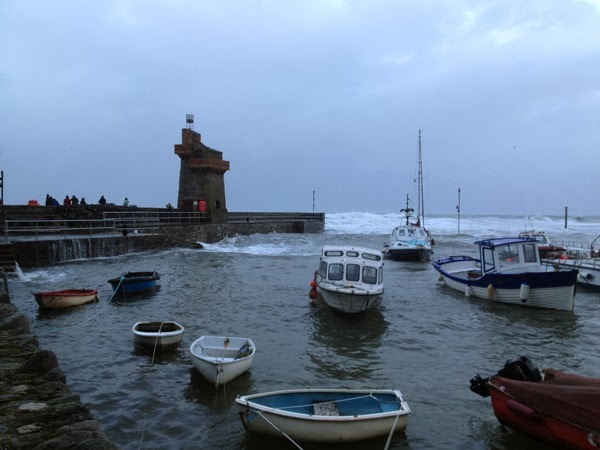 And another shot from the same place looking west, the boats you can see are inside the harbour, the harbour wall was under water. When we walked back over the bridge the water had flooded the road in front of the buildings and waves were crashing over the wall in all directions. The noise of the wind and water crashing twinned with twilight and the fact that the whole village had turned out to look at the sea made it a very surreal experience. In a very strange way it was magical and I’m glad we braved the storm.